Hello Everyone! I have been so busy having adventures that I have neglected to post, for like a really long time. Feeling inspired from my recent fishing trip to Norway, I am back and ready to blog it up. I mean it! As god is my witness, I'll never not post again! Check back this week for posts from Norway and the 6th Annual European Tenkara Convention. Until then, I will leave you with this picture of me and the cutest little guy! Not my husband silly, I'm talking about the cute little brown trout. Random Fact: I never met a free sticker I didn't like 😂😂 This isn't even the entire collection! Guess I will be buying a new Nalgene to have a place for all of these suckers! No more room on this one! I am officially a 2,000 - miler! Now my only question is, "Do I embrace my inner geek and hang this up on a wall!?" Here I am on day 14 - arriving at Castrojeriz with 469.4km (291.7 miles) left until I reach the end of my journey to Santiago. The last two weeks have been filled with walking, new friends, and taking in the sights and history of Spain. I have had an interesting time trying to change my hiking mindset from "long-distance AT hike" to "modern-day pilgrim", and many of my Appalachian Trail friends have asked me what I think of the Camino. I hope some of this information helps answer your questions. Disclaimer: I am on a hostel apple computer - so this will be a quick post! The first few days in the Pyrenees felt like being on the AT again! Challenging climbs with great views as your reward. Once out of the Pyrenees the landscape is more farmland, rolling hills, or flat. You are hopping from town to town, and mainly walking on paved or gravel roads. I have found this to be harder on my knees than the trails of the AT. This forced me to buy trekking poles. And a knee brace. People! There are always people walking with you or near you the entire day. At first, I was set in my Ninja ways, trying to hike it fast and solo. Now I welcome the slower pace and great company to share the day. There is such a diverse popluation of pilgrims walking the Camino - all ages, male and female, pilgrims from Spain, France, Germany, Australia, Brazil, Ireland, Hungary, Canada, Mexico, USA, and everywhere else! 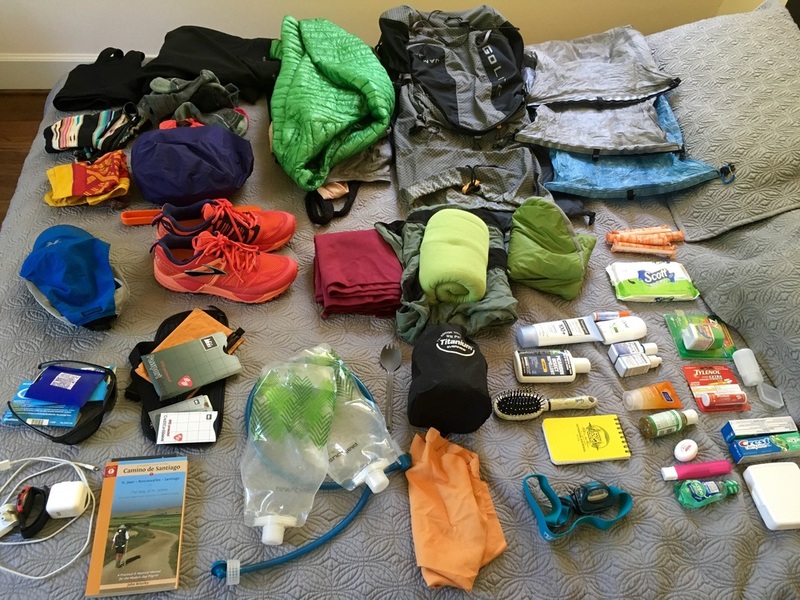 On the Camino I only packed snacks, and carry about a liter of water on average. There always seems to be a town with a water fountain to stop, eat and refill. The one thing that has not changed is water treatment. If I get water from the fountains or hostels I immediately chemically treat the water. Many pilgrims keep buying water bottles out of fear and others drink it straight out of the fountain with no problem! But treating the water works for me. I have loved the sights along the countryside and in town. I geek out at the sights of ruins or of a giant cathedral in the city. You almost feel a link to the pilgrims that walked the Camino centuries ago when you gaze up at the awe inspiring cathedrals that mark each town. Hostels! Every night I have stayed in a hostel, and I feel so spoiled. Showers ever day and a bed to sleep in at night. No hanging bear bags or waiting to do laundry every five or six days. I smell way too clean and my phone is always charged. We do not talk mileage. We talk days. Most of us have the same 33 day plan, so it cracks me up when we say only 19 days left without a breakdown of the miles! No emotional roller coaster... yet. On the AT, you have months to go through all kinds of different feelings. Here on the Camino I feel like I am on a backpacking holiday - you have the stability of a town every day with WiFi, and you never go too long without running into a friend. Early on, I seemed to get over any second guessing my motivation to hike or missing my family. In that sense, last year on the AT makes me feel like an old pro on the Camino. My advice? The heat on the Camino can be rough. One word - sunscreen. Also, try to get out early so you can be in your final town by noon. Overall, it has been a great time thus far on the Camino! I really have enjoyed the trip so far. You cant really compare the experience to the AT - they are so different from each other! Hope to post more soon. For my friends and family that do not know - my foot is healed and I am off to hike the Camino de Santiago with my friend, Jennifer! Your response may be, "But, Kaylan! What about finishing the AT?" Don't worry, I will tackle that when I get back. El Camino de Santiago - or, "The Way of Saint James" - is a pilgrimage ending in Santiago de Compostela, Spain. For over a thousand years Christians have made the trek to the Cathedral of Santiago, which is rumored to have the remains of Saint James, an apostle of Jesus Christ. Saint James spread the word of Christianity in Galicia. Saint James eventually returned to Jerusalem in 42 AD only to be beheaded by Herod, securing his spot in history as a religious martyr. His body was brought back to Spain by his disciples and buried in what is now Santiago. In medieval times walking the Camino was a great way to have your sins forgiven without penance. Today pilgrims hike the Camino for many reasons, both of religious and secular origins. There are many paths you can choose to hike - the Camino Portugues, Camino del Norte, Camino del Salvador, and so on. 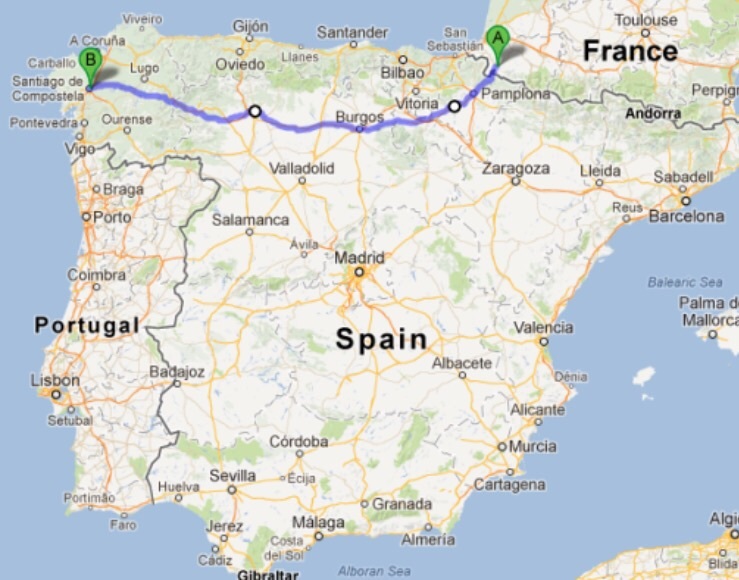 We have chosen the "French Way", traveling through northern Spain to reach Santiago. This is considered a more traditional route. It is 776km (482.3 miles) long and starts in St. Jean Pied De Port, France, crossing into Spain on day one through the Pyrenees. Check back here or on Instagram for more updates on my Camino adventure!